As the female professor who has accused US Supreme Court pick Brett Kavanaugh of sexual assault gives her testimony, women across the US have been reacting on social media. Many who support Christine Blasey Ford, speaking publicly for the first time, drew attention to what they see as a historic moment for women's rights. But those who back Mr Kavanaugh wrote that Ms Ford was acting throughout her testimony, and suggested her accusation was part of a Democratic plot to derail the judge's confirmation to the Senate. Law students tweeted pictures of empty classrooms as they gathering around television screens, while #KavanaughHearings trended globally. The question of whether to believe Ms Ford's testimony was at the forefront of comments online. Women tweeted hashtags #BelieveWomen linked to the Me Too movement and focussed on Ms Ford holding back tears as she spoke. But women using #BackBrett highlighted Ms Ford using notes as she spoke. Many commented on the bravery required for an alleged assault survivor to describe her ordeal on the national stage, focussing on Ms Ford's recollection from the night that "their [the men's] laughter at my expense" was her strongest memory. Founder of the Me Too movement, Tarana Burke, commented from the hearing that "listening to this woman's voice shake as she pushes through this moment... my heart." However, women who support Mr Kavanaugh suggested that Ms Ford is not credible. "As a woman, a mother, and a former victim of assault myself, how any of you feminazis out there are buying this is completely beyond me," wrote @RebekahWorsham online. Media captionWomen from both sides were protesting on Capitol Hill on Thursday ahead of the hearing. Another wrote, "she is an expert in pyschology, so she knows how to play an audience." Ms Ford's quiet and exacting testimony was applauded for its use of scientific logic as she explained to the Judiciary Committee why she was 100% confident in her recollection that her assailant was Brett Kavanaugh. "Dr. Blasey Ford answering these questions with her specific expertise is GREAT," wrote journalist Jessica Valenti on Twitter. "Dr Ford's scientific breakdown of how a person normally embeds memories was everything," commented @girlsreallyrule, while comedian Kathleen Madigan wrote, "Dr Ford just mic drop some science of memory on the committee." Others commented on the largely male make-up of the panel hearing Dr Ford's testimony, suggesting that it was an example of "institutional patriarchy". "[Senator] Chuck Grassley is now interrupting Senator Feinstein, the most powerful woman in the room, during her opening statement. Lovely," wrote @Charlotte Clymer on Twitter. 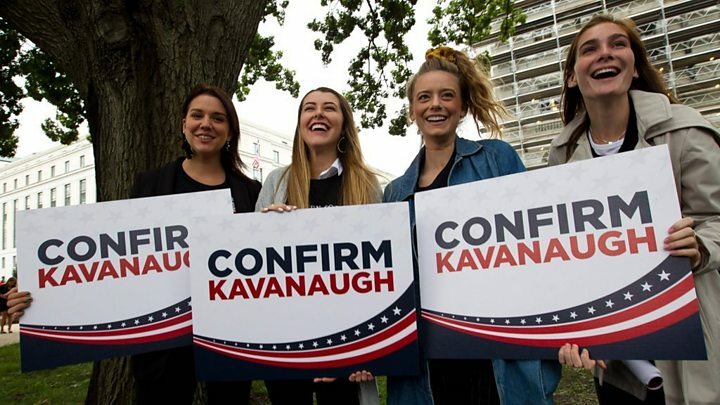 But some Republican women watching the hearings did not change their minds about whether the accusations should prevent Mr Kavanaugh from joining the Supreme Court.